Home > Bows, Headbands, Crochet Head Caps > Embroidered Birthday Bow For Girls. 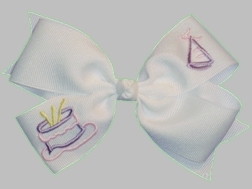 This cute birthday bow to match our birthday dresses and outfits is made of 1.5 inch grosgrain ribbon, and is embroidered with a beautiful cake on one loop and a birthday hat on the opposite loop. You choose the color scheme according to your little one's birthday outfit. All bows are made with alligator/French clips to accomodate all ages of girls. We can special order different color schemes. Special orders take 3-4 weeks to create. As this item is custom made upon your order being placed, please allow 2 to 3 weeks for crafting and shipping.